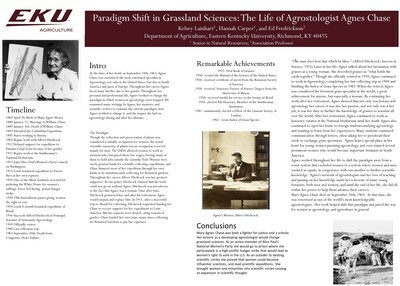 "Paradigm Shift in Grassland Sciences: The Life of Agrostologist Agnes " by Kelsey Lainhart, Hannah Carper et al. Kuhn defined a paradigm as “an accepted model or pattern”. He further describes a scientific paradigm shift as a change in the basic concepts and experimental practices of a scientific discipline. In challenging the status quo, Agnes Chase changed the very core of grassland sciences. As an agrostologist Agnes Chase described the relationships among grasses and glasslike plants to provide a nomenclature and classification system that enables grassland sciences. During a time when women and men of color were prevented from achieving status as scientific professionals Agnes Chase, and her immediate colleagues, would challenge this barrier and ultimately improve how scientific data are collected, while widening the framework in which grassland sciences are conducted. We describe the life of Agnes Chase and the paradigm shift in grassland sciences she created.